ZAMBOANGA CITY, Philippines (Mindanao Examiner / October 5, 2009) – The Alliance for the Advancement of Moro Human Rights, KAWAGIB, has condemned Monday alleged militarization and indiscriminate aerial bombings in the southern Philippine province of Sulu, where security forces are fighting rebels. The KAWAGIB reported that women, children and innocent civilians fall prey and targets of joint forces of Filipino and US troops’ manhunt operation against alleged Abu Sayyaf militants. 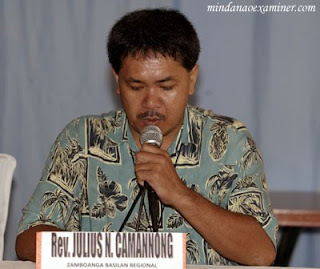 It said on September 20 while Muslims gathered to pray for Eid’l Fitr, Philippine Air Force planes indiscriminately bombed Sitio Talibang in the village of Buanza in Indanan town and killed a Muslim preacher and a 19-year old woman, Wilma Ambil, who was 7 months pregnant. The shelling continued for four days and resumed again on September 28 that targeted areas near Moro National Liberation Front under Ustadz Habier Malik which sparked fierce clashes. “Innocent civilians become targets of indiscriminate aerial bombings; their houses were destroyed including their sources of living. Documented victims of forcible evacuation reached 1, 739 families or 5, 725 individuals; some in evacuation centers while most of the evacuees are undocumented. 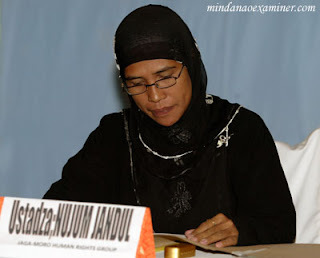 Relief assistance were restricted only to areas not in armed conflict where evacuees are temporarily sheltering, in essence food blockade in areas of armed conflict occurs,” said Bai Ali Indayla, KAWAGIB’s Secretary-General, during a press conference in Zamboanga City. She said they would file criminal charges against the US and Philippine military forces involved in the Sulu operation and submit their findings to the Commission on Human Rights and the Philippine Congress. “For several times, the US-Arroyo regime in its nine years of administration had shown disrespect to the culture of the Moro people. On February 11, 2003, government troops attacked Buliok Complex in North Cotabato while Muslims pray on Eid’l Adha, the same that they launched aerial bombing in Indanan, Sulu on September 20, 2009, while we pray on the Eid’l Fitr. The ruthlessness of this government is so blatant; it also scored massacres on the Moro communities like the Maimbung Massacre in 2008; Mandi Massacre also in 2008, and Padiwan Massacre in 2005, not to mention the hundreds of civilian victims of military crackdown in the province of Basilan when Arroyo declared state of lawlessness in 2001,” she added. She said no justice was given to victims of human rights violations and instead military officials were even promoted despite the killings of many Moro people. “At worst, US troops are also perpetrators on these human rights violations because they participate on actual combat operations. In the name of US economic interest, as the top agenda of the Arroyo administration, Gloria Arroyo sacrifices the lives of the Moro people and the entire country. 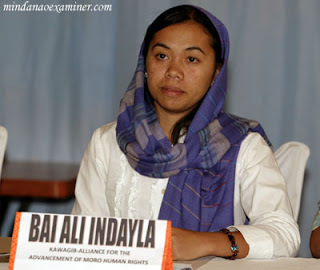 The Arroyo Administration-a puppet of the US government has perpetrated the total sell-out of our territorial integrity and national sovereignty,” Indayla said.